About how many watts or current would it take to cause this given a sustained overdraw and not a surge? CPU was pulling too much current for too long, but I'm still surprised given I didn't recall seeing EPS12V connectors slagging during the last subzero overclocking event I was at. Or am I approaching this from the wrong angle, and this was probably a resistance & heat feedback factor? 4*7A (=336 watt) are still perfect for the 8-pin connector. More might hurt efficiency, but who of the overclockers cares about efficiency? hint: use a fan to cool the connectors. It takes about 14A for 18AWG to reach 90Â°C. At around 11A the temperature will settle down at ~75Â°C, which is still safe short-term (probably a week of 24h load). ATX standard takes about 1/2 of max, thus 18AWG = 7A carrying capacity. 16AWG nets 90Â°C at 18A, and ~75Â°C at around 20A. The trouble begins with bad contacts (oxidation, loose connector), where the electric resistance rises, causing the power dissipation to spike, producing heat. Yup to the above posts. The thing is rated for 7a/pin, but there are a number of things that can reduce that number and cause heat buildup. Heat buildup in turn makes the issues worse, which leads to heat buildup, etc. Given the age of the board involved in that picture (a Rampage II Extreme, I believe) and the wattage of the CPUs involved (which go >200w easily, but >300 is a stretch) I bet there were connection issues. When you're subzero the connector is being actively cooled by the PCB under the CPU being far below zero. That spreads via the big fat VCORE/GND/V12V copper planes and cools everything in the general area. That's the #1 issue when it comes to long term (>5 minutes) extreme cooling really, the cold spreading. They do burn up from time to time anyway, but not on modern stuff for the most part. There aren't any modern chips that can match a Nehelem or Gulftown for raw power consumption these days. I agree with bobnova. Probably connection problems. Also.. if they're going to play around with sub-zero overclocking, they really should update their motherboard and use one with an optional second CPU power connector. You guys are all awesome, thanks! For those curious it was a 980X involved and liquid cooled, although the PWM/connector area did have a 120mm fan blowing on it. Was the first casualty I've ever had from overclocking anything and the motherboard itself was such a good board that it was painful to lose it like that. (Don't get me started on Gigabyte's X58 hardware) I assume both are easily repairable but I just don't have the soldering skills nor wire tools. Regarding the connection problems that was the information I was given. I know the connector was fully latched as I had some trouble disconnecting it afterwards, but I will admit the PSU itself had seen quite a few system rebuilds and motherboard swaps in its lifetime. When you're subzero the connector is being actively cooled by the PCB under the CPU being far below zero. Ahh, didn't realize that! Makes sense in hindsight now that ya point it out. Probably it was a tiny bit loose, once the one pin that was loose started heating up it was all over. The 980x has caused more of those to die than any other part. They haven't killed as many connectors as Fermi GPUs have, but the Fermis in SLI kill the ATX24P connector. Modern stuff draws squat by comparison, which is why we don't see this much these days. Plus once the 980x came out motherboard manufacturers started putting extra connectors on (like the R3E, which was built specifically for the 980x). 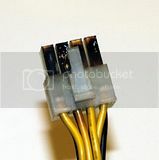 Difference between EPS12V and ATX12V 8 pin connectors? How do you get 2 EPS12V on the Seasonic X-750W? EPS12V - what's the point?